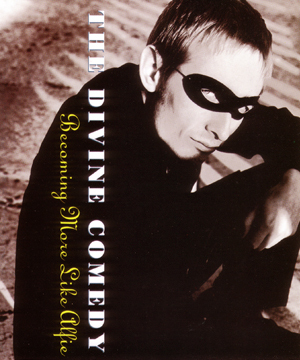 Released in summer 1996 after the success of Something For The Weekend, Becoming More Like Alfie is the second Divine Comedy single. It seems that the success of Something For The Weekend was quite a surprise for The Divine Comedy and so the band did not have new songs to offer as B-sides (even though there are still outtakes from the Casanova sessions). The second track is the cover of Orange Juice’s ‘Untitled Melody’ that was recorded in 1993 and released in Indulgence No.1. Then, the only ‘new’ track is the live version ‘Your Daddy’s Car’ recorded by the BBC for a Mark Radcliffe session. The final track is the – no longer – rare, but not new, demo version of ‘The Dogs And The Horses’ which was previously released by Les Inrockuptibles on their subscribers-only Nectar compilation.